by Lunsford, Andrea A.; Ruszkiewicz, John J.
Everything’s an Argument teaches students to analyze the arguments that surround them every day and to create their own. 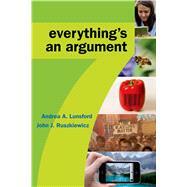 This best-selling text offers proven instructional content by composition luminaries Andrea Lunsford and John Ruszkiewicz, covering five core types of arguments. Revised based on feedback from its large and devoted community of users, the seventh edition offers a new chapter on multimedia argument and dozens of current arguments across perspectives and genres, from academic essays and newspaper editorials to tweets and infographics. Also available in a full version with 35 additional readings. John J. Ruszkiewicz is a professor at the University of Texas at Austin where he has taught literature, rhetoric, and writing for more than thirty-five years. A winner of the President’s Associates Teaching Excellence Award, he was instrumental in creating the Department of Rhetoric and Writing in 1993 and directed the unit from 2001-05. He has also served as president of the Conference of College Teachers of English (CCTE) of Texas, which gave him its Frances Hernández Teacher—Scholar Award in 2012. For Bedford/St. Martin's, he is coauthor, with Andrea Lunsford, of Everything’s An Argument (6th edition, 2013), and the author of　How To Write Anything (2nd edition 2012) and A Reader's Guide to College Writing (2014). Deborah Tannen, Why Is Compromise Now a Dirty Word? John Tierney, Can a Playground Be Too Safe?